Note : click on GIFs to see full-size GFY with playback controls. Also, click on images to see full-size JPG. It’s been an ongoing mantra so far this year : the defense is still struggling. It is a work-in-progress. These are Growing Pains. In Week 6 against the Chiefs, the offense struggled and desperately needed for the defense to step up, but unfortunately, the defense could not rise to the challenge of Andy Reid’s team. There were many failings and it is prohibitive to try to detail them all. One aspect that is worth studying is how Preparation has impacted the play. Without actually being part of the defensive preparation, it’s impossible to tell exactly what was happening, but by studying some of the plays, by looking at some of the scouting elements, and by cross checking, we can get an idea of what Ken Norton Jr and his staff were facing when going up against a well-prepared Andy Reid team. One way of describing the Offensive Skill Personnel for a given play is by “Personnel Groups.” This is a two-digit numeral with the first digit indicating the number of running backs (including fullbacks) and the second digit indicating the number of Tight Ends. The Number of WRs in infered by subtracting the number of RBs + the Number of TEs from 5. For example, 11 Personnel means 1 RB + 1 TE, which means 3 WRs. 20 Personnel means 2 RBs (generally a RB + FB) and No TEs and 3 WRs. 22 Personnel means 2 RBs + 2 TEs and 1 WR. An preliminary, first-pass approach to scouting a team’s run game is to check and see which Personnel Groups they favor and how effective they are. Count the number of attempts and tally up the total yards by Personnel Group. This will often give a general sense of what types of runs they use. From there, it is easier to focus in on finding what kinds of runs they use. Prior to this past Week 6 game, the Chiefs played 4 games (Week 5 was their Bye week) and faced (in order) San Diego, Houston, New York Jets, and Pittsburgh. 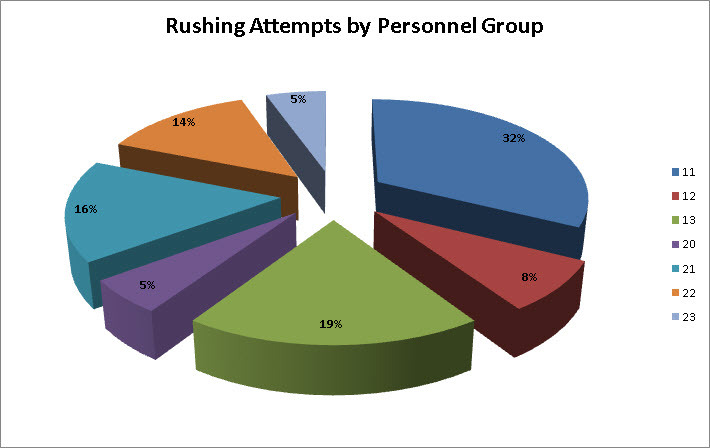 Here is a graphical breakdown of the rushing attempts by Personnel Group in the form of two Pie Charts. The Red pie slice in each chart is 11 Personnel, 1 RB + 1 TE and 3 WRs. There’s no missing it. The Chiefs are primarily an 11 Personnel running team. 55% of the Chiefs’ rushing attempts and 63% of their rushing yards came from the 11 Personnel group. Furthermore, of those rushing attempts, 75% of them were from shotgun. Preparing for the Chiefs’ rushing attack begins with preparing for their 11 Personnel run game, mostly focusing on their Shotgun run plays. We’ve already seen that 11 Personnel is both the highest number of attempts and the most cumulative yards. But this table also points out that the 11 Personnel group has the 3rd highest per carry average. 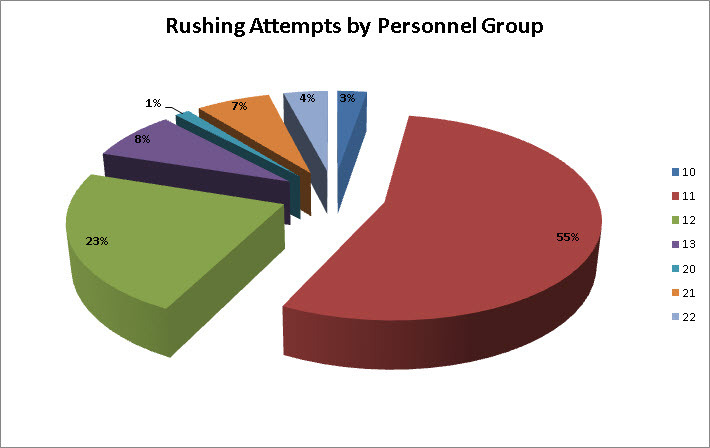 In fact, the two groups that have higher averages (10 and 20) are products of very few rushing attempts; 10 Personnel had only 2 carries while 20 Personnel had only 1 rush attempt. Notice that the next highest number of attempts is 12 Personnel, but it was not very effecient with only 3.2 yards per attempt. The approach to game prep is to defend the 11 Personnel runs. It appears that stopping those runs would give the defense a significant advantage. Traditionally, teams would use a 2 WR group (12 or 21 personnel) for early downs because it’s a nice balanced formation allowing for either passing or running and then in clear passing downs, they would substitute in a 3 WRs (11 Personnel). In the modern passing era of the NFL, increasingly many teams are using 11 Personnel as their base personnel group and using it for both run and pass. 11 Personnel means 3 WRs. Typically, this means that the defense will match it by bringing in their Nickel subpackage. The Nickel (5 defensive backs) defensive personnel group is generally a pass coverage unit since it takes out a Nose Tackle (Ellis or Williams) and brings in a Cornerback (DJ Hayden). So adjusting to that means spending extra time with the Nickel unit to defend base run plays. Side note : this is an area where Karl Joseph’s skill set may eventually provide additional benefit. IF his man coverage abilities become good enough, then the Raiders may be able to play BASE defense against 11 Personnel, using Karl as a Nickel CB (a la Tyrann Mathieu). This actually happens this game later in the 3rd and 4th quarter. Here is a look at three of the 11 personnel run plays. Play #1 : 1-10-OAK 32 (8:32) (Shotgun) J.Charles up the middle to OAK 30 for 2 yards (S.Calhoun). The typical 11 Personnel inside zone play. Charles takes the ball and hits it up into the A-Gap, but LB Perry Riley reads it and attacks that gap, beating the block of LG Parker Ehinger. Charles sees the defender and so he bounces to the outside, but Shilique Calhoun plays the Read-Option perfectly and makes the tackle. Play #2 : 2-3-OAK 29 (6:31) (Shotgun) S.Ware up the middle to OAK 27 for 2 yards (C.James). 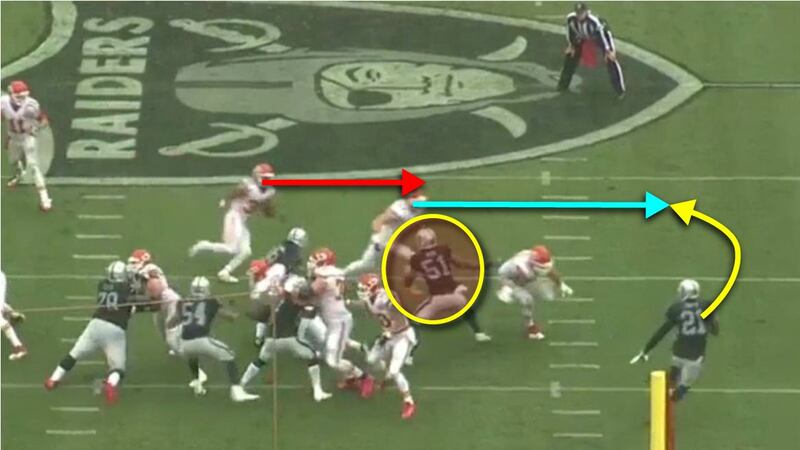 Denico Autry slants inside hard and even though LT Eric Fisher is able to wash him out of the play, it still disrupts the blocking and interferes with the running lane. 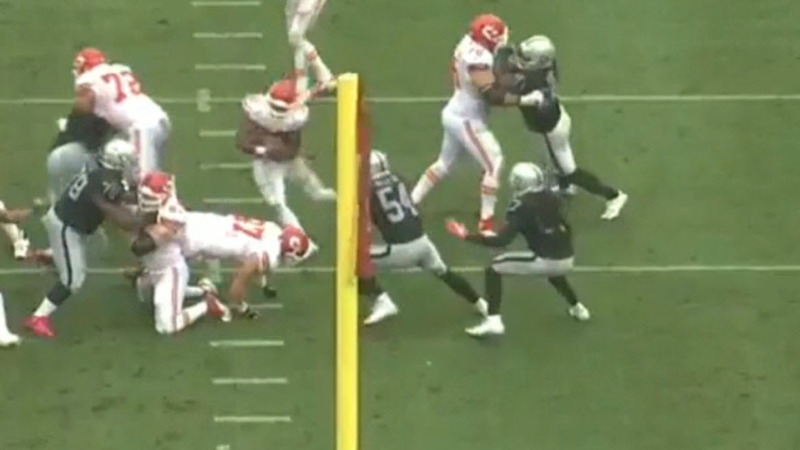 Autry effectively cuts off the TE Travis Kelce, who ends up falling to the ground. Bruce takes on the pulling RG Laurent Duvernay-Tardiff and keeps the play inside, allowing Reggie Nelson and Perry Riley to fill the interior running lane. Note that Riley and Nelson are not quite in sync. Riley cuts off Nelson instead of playing inside leverage. Perhaps an indication that Riley is still working on the new team chemistry. Cory James hesitates initially for a moment. Once he recognizes the play, he goes under the block of LG Parker Ehinger and then gets in to make the tackle. 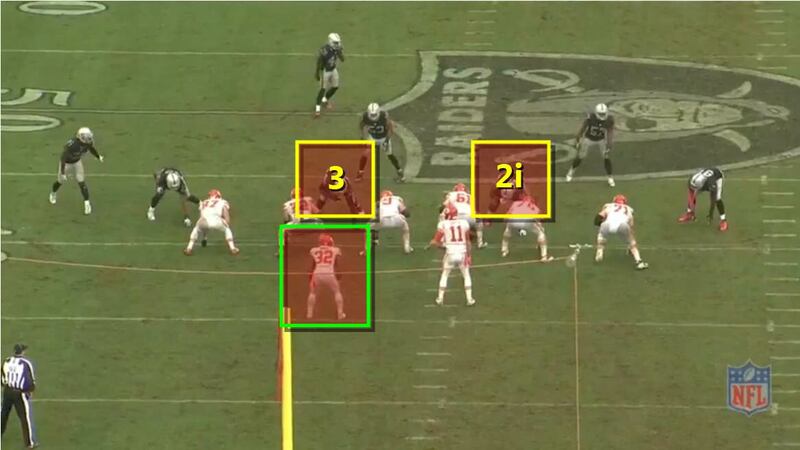 Again, it does appear that the Raiders’ defense was prepared for this play and executed very well. Play #3 : 3-1-OAK 18 (:45) S.Ware right end to OAK 20 for -2 yards (S.McGee). 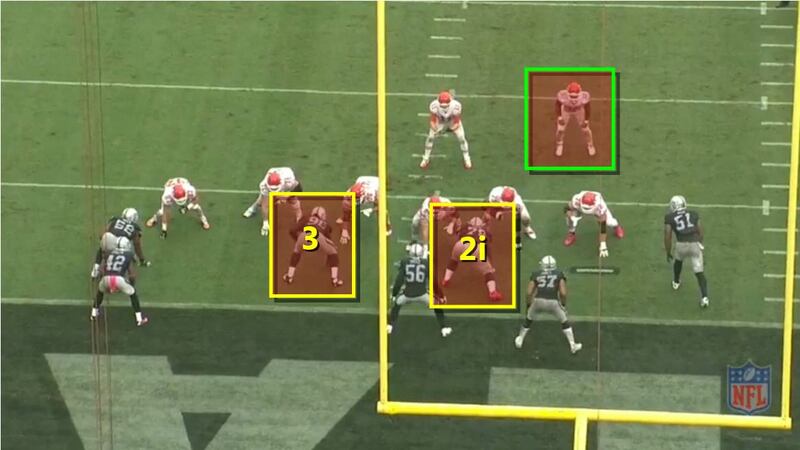 The first thing to notice about this play is that it is 11 Personnel, but the Raiders are in BASE defense. In other words, they did not subtitute into their Nickel package and instead are leaving their main defense in place. This means that Karl Joseph plays the role of the Nickel (slot) CB v #12 Albert Wilson. The defensive interior front is Latham – Jelly – Stacy McGee with Mack and Bruce on the outside and Cory James and Malcolm Smith as the interior LBs. This may be situational because it was 3rd-and-1, but later in the game, Ken Norton Jr would put the base defense on the field often against the Chiefs’ 11 Personnel group. 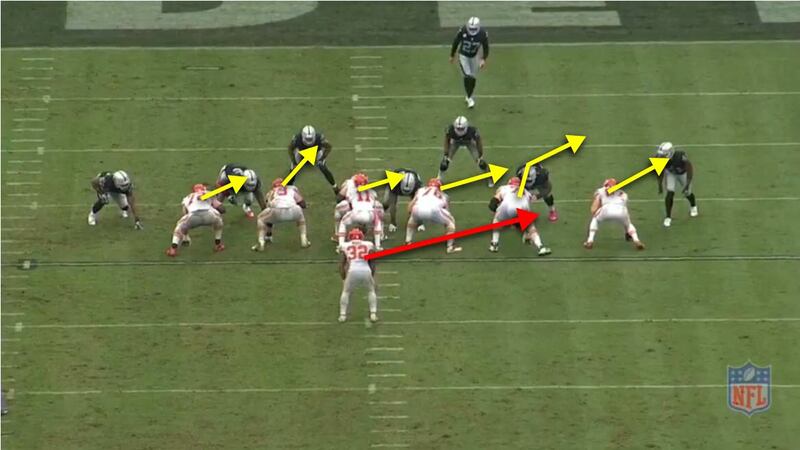 This time the Chiefs run outside zone and the Raiders’ defense swarms it like you want to see and players like Stacy, Jelly, and Bruce are winning their individual matchups. Bruce plays force on TE Travis Kelce and force Ware to cut back inside. Justin Ellis pushes Chiefs Center #61 Mitch Morse into the RG #76 Laurent Duvernay-Tardiff, who falls to the ground. McGee was in a Rip move on Tardiff and then is freed to make the tackle. Team Defense at its best, showing that this unit can make plays if they can execute. Unfortunately, they did not do so enough. 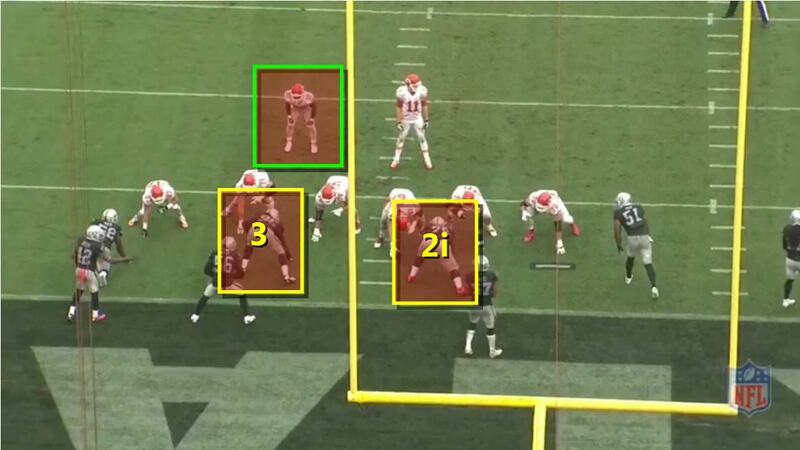 Perhaps the most face-palming play of the day was when the Chiefs lined up in a simple 11 Personnel shotgun formation and when the runner motioned from one side to the other, the entire defense engaged in a Chinese Firedrill and gave up a 9 yard run. There were other bigger runs, but this one seemed to exemplify a defense that had no idea what it was doing on the field. Later, though, in studying the flow of the game and then looking to see what was going on during the play, it seems far less egregious than before. In fact, it looks like some of the things that fans want “adjustment and recognition” were actually happening but the problem was that the entire defense was not seeing it together. 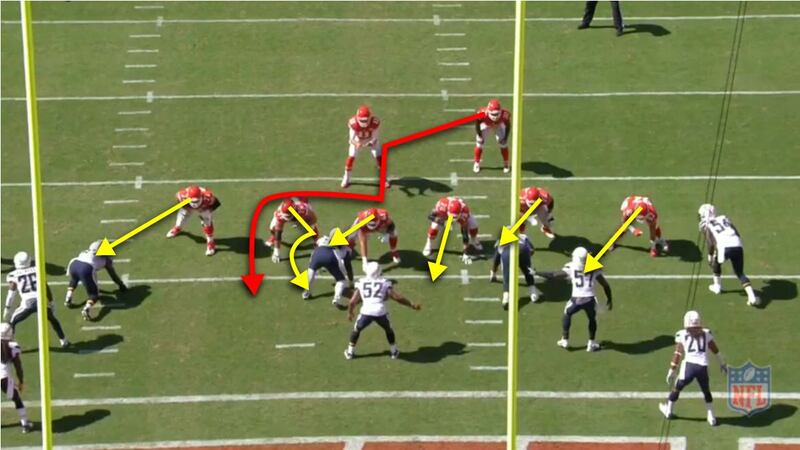 First, here’s a look at an earlier play where the Chiefs did the exact same thing. It’s the same Personnel group, the same formation, and the same pre-snap RB motion. Note : not pictured, but in both plays, the WRs are in the same bunch formation and they run the same fake bubble screen. 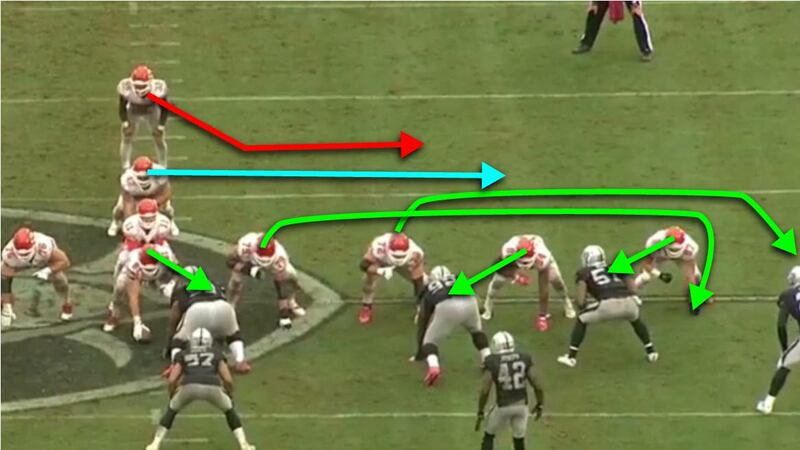 On this play, when the RB motions from one side to the other, the LB adjust, but the defensive line does not. Denico Autry as the 3 technique on the same side as the RB while Justin Ellis is at the 2i on the opposite side. LBs adjust, but Denico stays at the 3 and Jelly stays at the 2i. Now, here’s the play with the confusion. RB Spencer Ware is on the strong side and Denico Autry is at the 3 technique with Justin Ellis at the 2i. Autry and Ware are both on the same side. Ware motions to the opposite side and the line is asked to adjust. 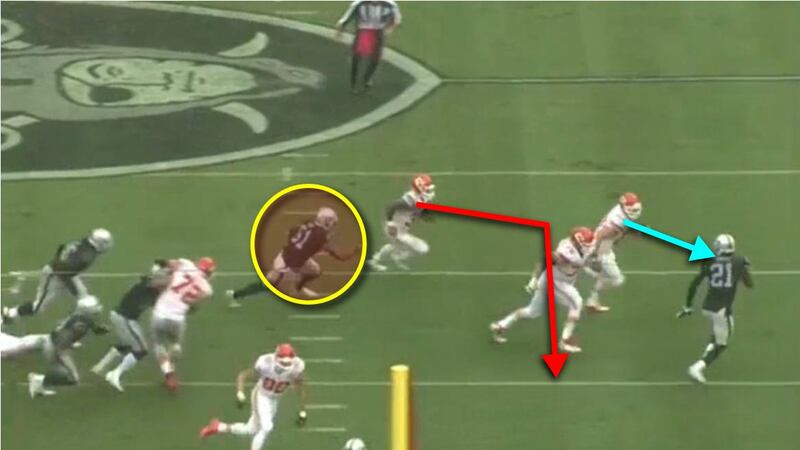 Mack slides in from the outside shoulder of the TE (7) to the inside shoulder (6i). Denico and Jelly are to adjust, but for some reason do not realize it until Malcolm, Cory, and Shilique finally communicate it to them. The defense is trying to line up like this, with the 3 tech on the same side as the RB and the opposite side DT play the 2i. And this looks pretty good to set up some angles to defend the inside zone. Though there is the real question of how much sense this makes personnel-wise. This puts Denico against G and C and moves Jelly outside; in essence it takes the quick, one-gap, slasher and moves him into a 2-gap position and moves the big, space-eater out to a “quickness” position. The Chiefs snap before the defense can get set, so Jelly, Malcolm, and Cory are out of position. The most problematic is Malcolm, because being so close to the line and so far inside makes him a painfully easy target for LG #79 Parker Ehinger to seal. 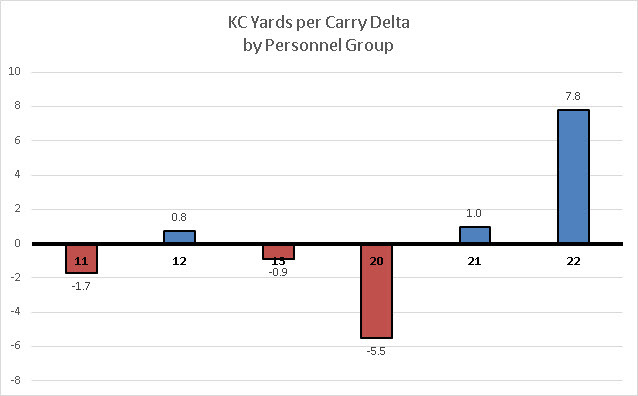 This 9 yard run was the most successful KC run from 11 Personnel all day. This appears to have been an in-game adjustment. That after the success with the motion on the Touchdown, Ken Norton adjusted to have the defensive front flip if the RB flips. If so, this shows some of the difficulty of adjusting with some younger players. Note Justin Ellis is not typically part of the Nickel Package (it’s normally Denico and Jihad), but since 11 Personnel is not a strict passing group, Jelly is inserted here to provide run defense. 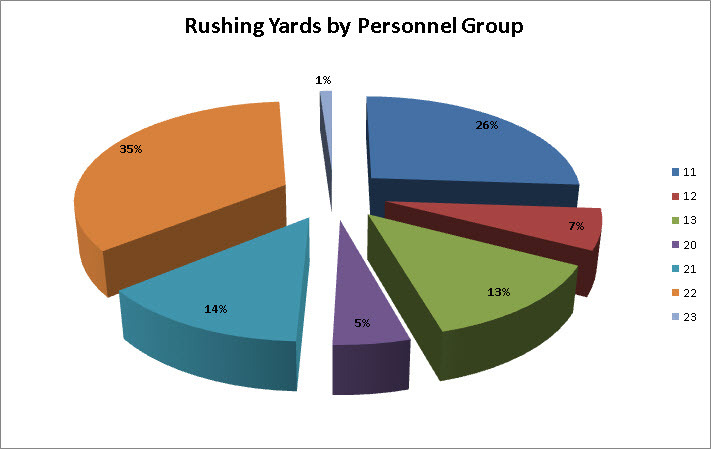 11 Personnel was still their most often used Personnel Group for rushing plays, but it was not as overwhelmingly so. Blue is 11 Personnel which is 32%, but both 13 (Green) and 21 (Cyan) Personnel are substantial at 19% and 16%. This shows that the breakdown in yardage is even closer than the attempts. In fact, the most yards were not gained by 11 Personnel. 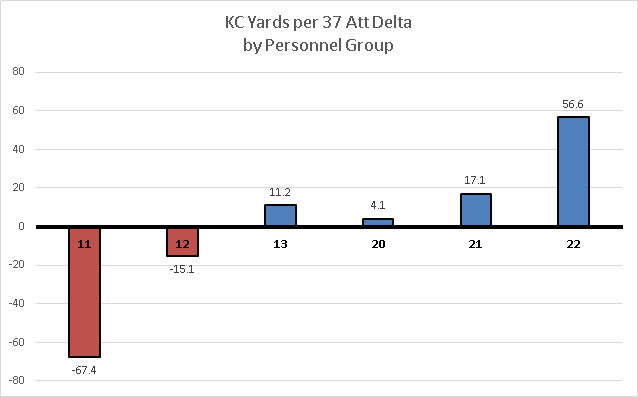 Previously, we noted that KC was predominantly an 11 Personnel running team in Weeks 1-4. In Week 6 (after an extra week to prepare), they came into Oakland as a more varied attack. 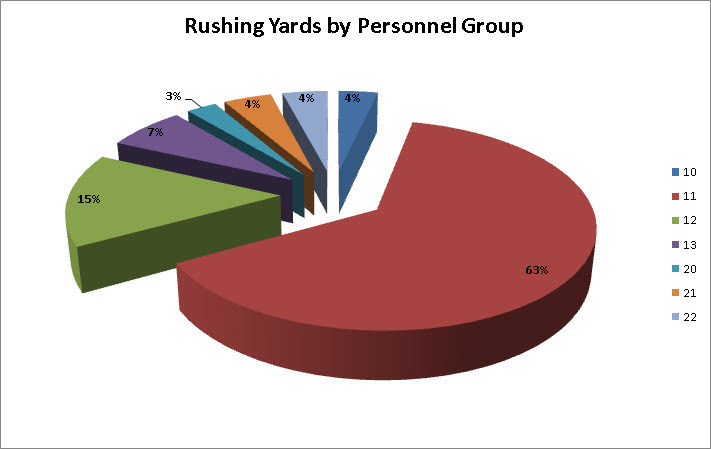 Here are Bar Charts showing the relative frequencies of rushing by Personnel Groups. Taking the previous 4 games’ worth of rushing statistics and scaling them down to the 37 attempts they had in Week 6 allows us to compare “apples to apples”. 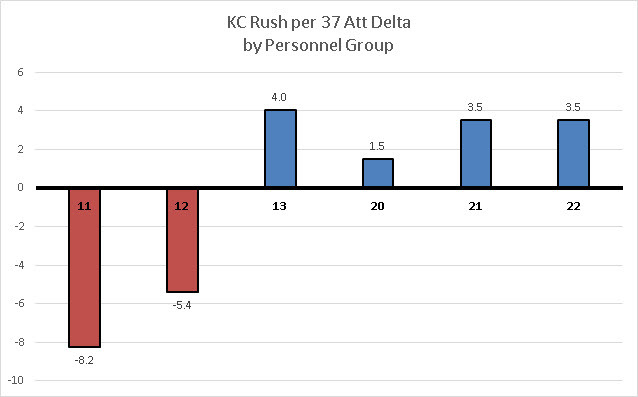 Of the 37 rush attempts the Chiefs had, the Weeks 1-4 data would project them to run from 11 Personnel about 20 times. However, in actuality, they ran it 12 times, which is 8.2 fewer than expected. Similarly, they should have run it from 13 Personnel about 3 times, but instead they ran it 7 times, a difference of +4. The Chiefs’ 11 Personnel runs were down 67 yards, but that is made up by the significant increases in 13 and 22 Personnel runs. The Raiders’ Run Defense actually did an adequate job defending the 11 Personnel run, holding it to 4.0 yards per carry, which is not great, but it is much better than the Chiefs’ Weeks 1-4 average of 5.7. And while most others were held fairly normal, it is the 22 Personnel rushes that was the most improved. 13 and 22 personnel are on the opposite spectrum as 11 Personnel. 11 Personnel is a 3 WR group which is traditionally a passing formation, but the 13/22 Personnel are a 1 WR group that has 3 “heavy” blocker types (TEs/FBs). 13/22 is an obvious run formation. If the defense uses Base Defense, it sets up a matchup of a CB v TE. In the passing game, that favors the defense, but in the running game it’s advantage offense. The overall stats for 13 Personnel looks good. Most fans (and coaches) would take 3.4 yards per carry any day. But what is concerning is that the defense alternated between well-defended plays and large yardage plays. Here is a look at some of those big plays and a look at what may have led to the defensive breakdown. 1-10-OAK 36 (7:09) (Shotgun) S.Ware left end to OAK 29 for 7 yards (S.Smith; K.Joseph). 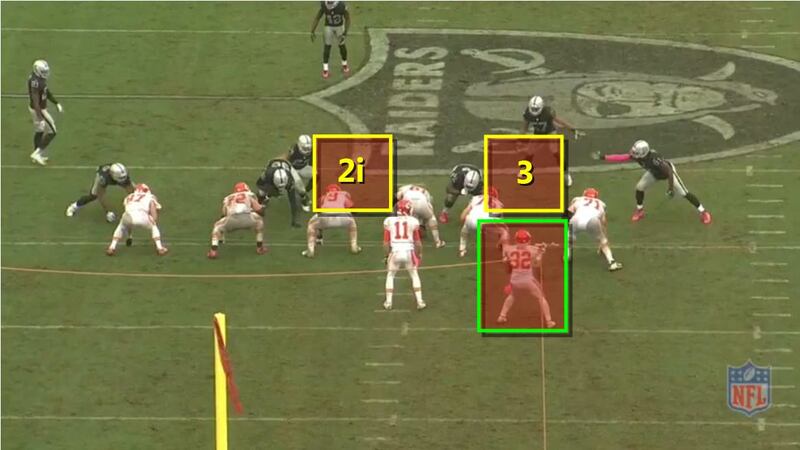 The Chiefs show the same pre-snap motion that they used in the Option play, but instead, they change it up and run the Counter Trey, the same play they run out of 11 but had not shown out of 13 or 22. 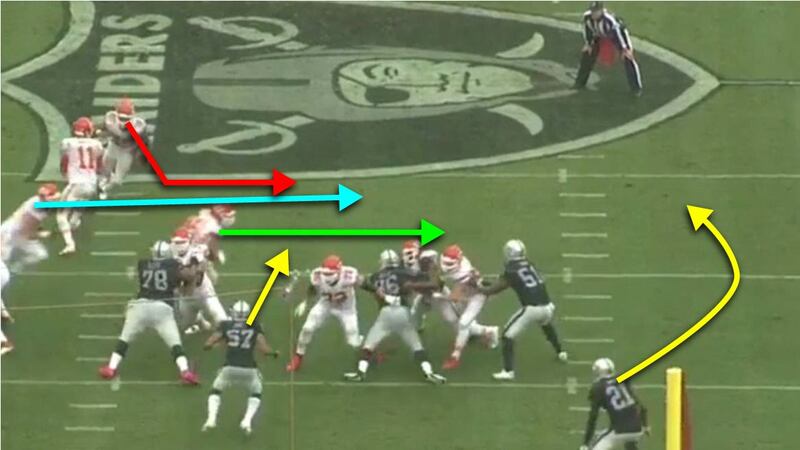 The Raiders’ defense was not guessing or playing the option, but they do not appear ready for this Counter Trey play. Counter Trey has downblocks from two TEs. Bruce’s eyes are on the runner and he does not see the pulling right guard. Cory James immediately attacks upfield. His aggressiveness takes him out of the play. Perry Riley is also drawn into the same gap. 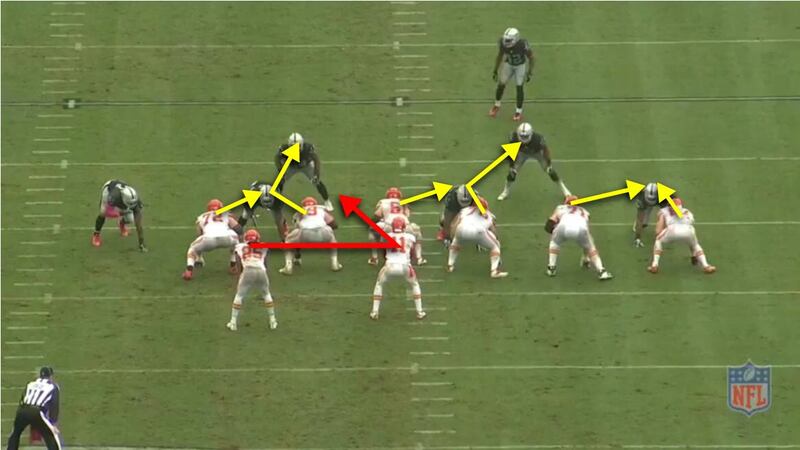 As soon as Bruce goes underneath the initial blocker, he gives the Chiefs exactly what they want. 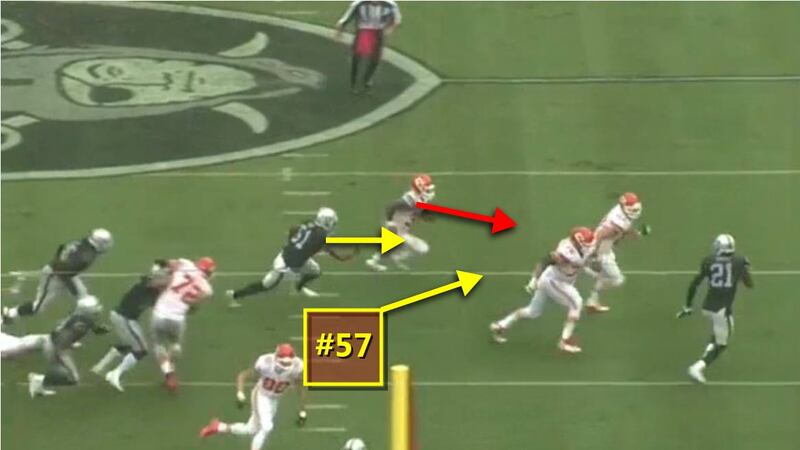 On the outside, Sean Smith has contain v the lead FB Anthony Sherman and Bruce Irvin is chasing. This is not a good look for Bruce. But as is often true, the team defense is problematic and so Bruce may not be wrong, but his actions exacerbated the situation because there is little help from his teammates. Notice that there is no inside pursuit. Cory James is in a wrestling match with #72 Eric Fisher; since Perry Riley reads and attacks that same gap, he’s also screened away from the play and unable to properly pursue. Presuming Cory James could have cleared potential blocks by Eric Fisher and the TE #80 James O’Shaughnessy (a LB is typically expected to avoid an OL block when in open space), he could have had an inside pursuit angle to hold Ware to a minimal gain. It’s hard to tell what exactly the failing was. 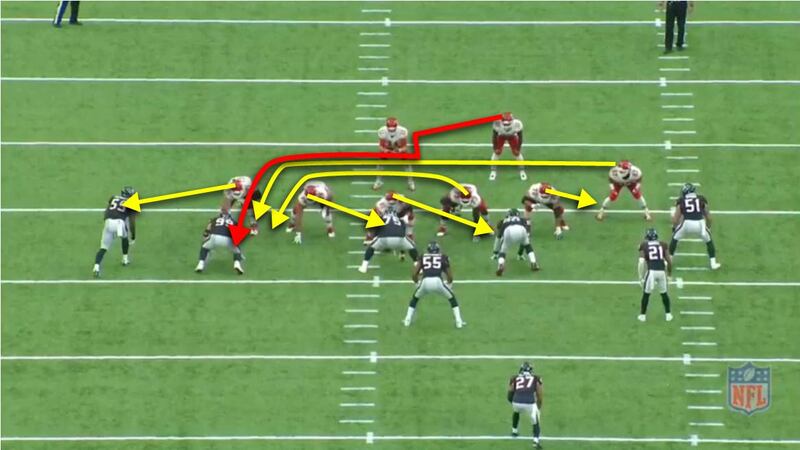 This play had a few notable problems and when combined it allowed the Chiefs to break off a nice gain. Schematically, it is a little worrisome to have Smith to be contain against 13 Personnel which forces him to match up against a FB. Bruce may have gotten himself out of position by diving under the block and the two interior linebackers both take themselves out of the play by misreading the play and being overly aggressive. Recall that the Chiefs only ran 13 Personnel 6 times in 4 games (3 of them option plays) so there’s not a lot of play to look for. 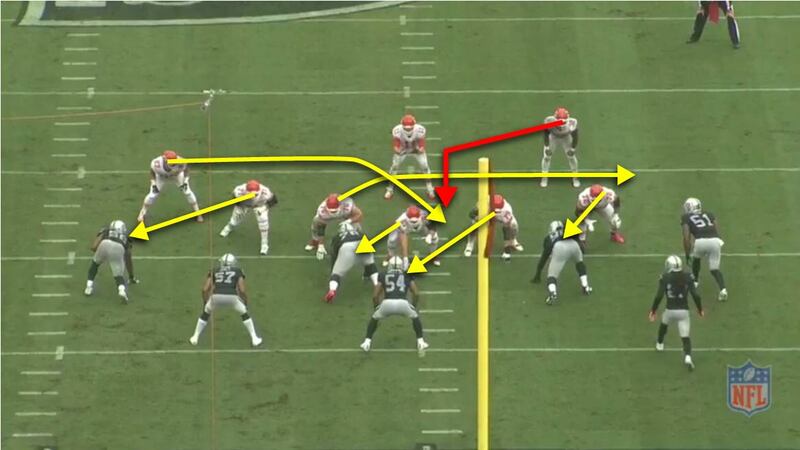 And that (coupled with the number of Inside Zone runs from 11 Personnel that the Raiders saw) may influenced Bruce Irvin’s reaction on the biggest run of the day, a 45 yarder that was able to get outside the edge. 1-10-OAK 48 (13:20) S.Ware left end to OAK 3 for 45 yards (R.Nelson). The most visible and puzzling thing is what Bruce Irvin does : He jumps inside and vacates his responsibility, which is exactly where the Chiefs run. Bruce Irvin was the key player here and it appears that his first reaction was to anticipate inside zone, but it was not an inside zone play. Rather it was a play that the Chiefs did not show (much) in their previous games. A Pin-and-Pull play. The offense wants to Pin the defenders to the inside and then get the runner to the outside, outflanking the defense and getting downfield. On this play, the two tight ends block down on Jihad and Bruce while the two playside linemen (LT Eric Fisher and LG Parker Ehinger) pull and get out to block. Bruce makes a misread/guess and jumps inside, creating a soft edge and making it very easy for the TE to Pin him inside. 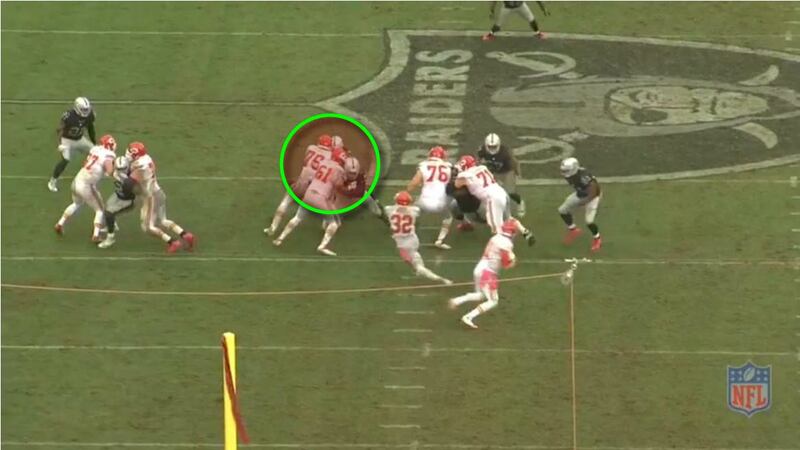 Sean Smith has Corner Force on the play and it is tough enough against a TE, but against Eric Fisher, he has no chance. And then Karl Joseph supporting the play gets met with rookie 4th round LG Parker Ehinger, 6’6″, 330 lbs. Even without Bruce jumping inside, this play looks like it was set up to succeed because Andy Reid is able to schematically create very favorable matchups. The run defense is doing some good things and they are showing some improvements. But unfortunately many of them are being obscured by the significant breakdowns. Some assignments are being fixed, communications are being fixed, some discipline elements are being fixed, some one-on-one matchup battles are being fixed. Right now, it’s not close to that. 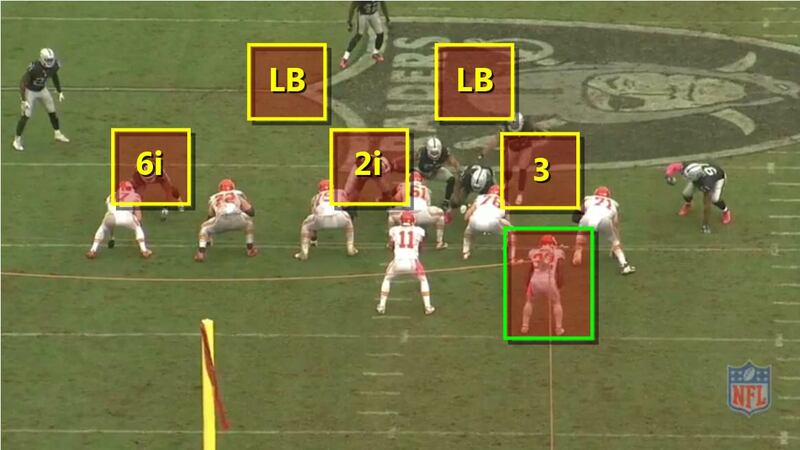 Part of the reason that the Raiders’ defense was exposed in this way is because on the other side, the Chiefs were so very well-prepared. They had clearly scouted their own tendencies and had altered them; they used different Personnel Groups with more frequency than previously and they used different plays than they had shown earlier this year. At times, the run defense did look prepared for the play, but many times they were taken by surprise and it often felt that Andy Reid and his offensive staff was one step ahead of Ken Norton Jr. In particular, the 13/22 Personnel Group running attack has been a problem all year and it does not seem to have been addressed. This may be a case of poor self-scouting or it may be a problem with so many other issues to address first. In any case, this is something to pay close attention to going forward, because opposing Offensive Coordinators will see this same thing on tape. The Chiefs ran crazy last week, racking up over 180 yards on the ground. It is important to recognize that the Chiefs are a very good team and that their running game has been very effective all year and not just against the Raiders. In fact, the Chiefs’ rushing attack was about as efficient as they have been through their first four games. against the Raiders. There was more volume due to more opportunities. That was partly due to the defense’s inability to get off the field, but also partly due to the offensive futility in the 2nd half. The next 2-3 games (Jacksonville, Tampa Bay, Denver) will be very telling as these are potentially explosive offenses, but not ones that are consistent and they are all lead by inexperienced quarterbacks. Ken Norton will have to be able to anticipate correctly. If the preparation is on point, the defense has a good chance of showing up and surprising people. Part of that was the advantage the Chiefs had with an extra week to prepare, but also a significant problem was the preparation of the Raiders’ defense. The players’ reactions and the overall team execution looks like they were not properly prepared and that many things that showed up in the game took the players by surprise. This would seem that the Defensive Game Plan and Preparation leading up to the game was flawed. This has been recurring often this year. New Orleans started it off. Atlanta brought on a different look and scheme that had defenders reacting poorly. Tennessee had a scheme that was totally unaccounted for and now KC borrowed some from Tennessee as well as using their own changeups. This is like having a History Test and studying the wrong chapter. They studied the 11 Personnel plays, but didn’t spend enough time on the 13 and 22 Personnel ones. A huge part of the battle on the field is the preparation on the practice field and in the film room. Right now, it appears that this is failing the men. Mixed within the big plays that the defense surrendered were some indications that these players can make some plays. If the defense can play sound, can make the right reads, can stay disciplined on their assignments, they can be a good unit. The run defense can start to come together fairly quickly once everything is addressed. But if Ken Norton is not able to prepare, scout, and anticipate then the defenders on the field may find themselves continually fighting this type of uphill battle.